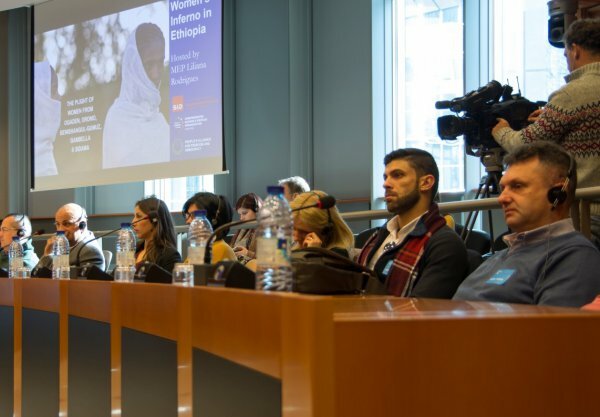 A conference hosted by the Unrepresented Nations and Peoples Organization (UNPO), entitled “Women’s Inferno in Ethiopia: The Plight of Women from Ogaden, Oromo, Benishangul-Gumuz, Gambella & Sidama”, has drawn criticism from the Ethiopian Embassy in Belgium. As a rejoinder to the press release published shortly after the conference, the Ethiopian Embassy in Belgium issued a response alleging that participants of the conference “accused the Ethiopian government of being oppressive towards women.” The remainder of the response enumerates the actions taken by the Ethiopian government to end Female Genital Mutilation (FGM), to improve maternal mortality rates, to facilitate financing for women entrepreneurs and other measures intended to protect women’s rights. UNPO does not deny the significance of these developments. However, few of these statements and figures show a demonstrated commitment to reducing the specific plight of women within marginalised regions. Where it concerns UNPO Members affected by intra-state conflict, engaging with state representatives is of critical importance to our work. For this reason, UNPO viewed the intervention of an Ethiopian government representative during the questions and answers session at the end of the conference as a positive show of responsiveness. While the representative itemised a list of progressive actions that have been taken to safeguard women’s rights in Ethiopia, the extent of the relevance of these actions to residents of Ogaden, Oromiya and the other regions addressed was unclear. Furthermore, the implementation of certain women’s rights measures is commendable, but it should not deflect attention from the gross human rights violations occurring in these regions. By criticising the “one-sided vision of the situation” in the conference, the Ethiopian Embassy in Belgium regrettably overlooks the diversity and quantity of testimonies evidencing the dismal human rights situation for a number of ethnic groups in Ethiopia. It is precisely the compound effect of being politically marginalised within Ethiopian society that changes the dynamic of the gender-based and sexual violence to which these women are subjected. The social, political, and economic empowerment of women in Ethiopia is a shared goal of UNPO and the Ethiopian government. However, this goal must necessarily consider the relative disenfranchisement of women from different ethnic groups, as well as the intersectional forms of violence they encounter. UNPO does not condone the Ethiopian government’s inattention to the atrocities committed by authorities against members of these marginalised communities. A call for basic fairness was, coincidentally, the principal objective of this conference – to provide a platform for members of these communities and particularly for women, whose rights are systematically violated in Ethiopia.